BARRE — After the Vergennes Union High School boys’ basketball team defeated No. 2 Burr & Burton in this past Saturday’s Division II championship game, 62-49, the No. 1 Commodores’ hundreds of fans — who once again made a neutral site sound like a home game — chanted what their team had accomplished for the first time in program history. Each January, teachers and students at the Lincoln Community School dive into an intensive month-long study of a culture different from their own. The tradition has carried on for eight years; in the past, students have learned about China, Ghana and many other cultures. We've made complete charts of the polling results we received from around the county. 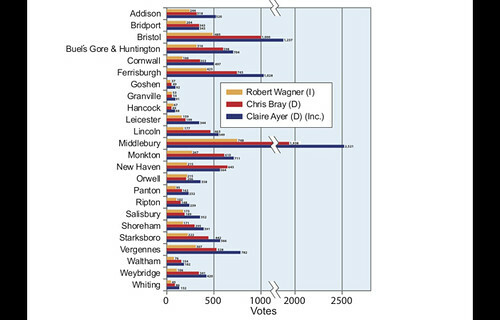 Check them out to see how your town voted! The Addison County Maple Sugarmakers Association runs their sugarhouse every year at the fair. They make homemade maple goods including cotton candy and milkshakes.